All-levels class influenced by various mind body fitness practices including yoga, pilates, barre, dance and suspension training. Increase your aerobic and fat-burning capacity in this alignment-based Balanced Athlete® class, which incorporates high intensity interval training (HIIT). 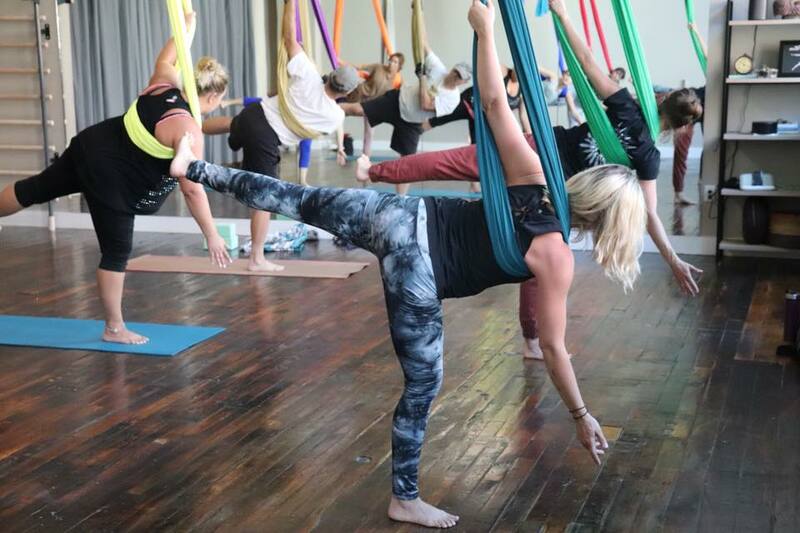 This movement class blends elements of Pilates, dance, yoga and functional training. These classes are mindfully crafted to allow persons experiencing pregnancy, and postpartum to honor the changes that occur in the body during the child birthing years. Suitable to any stage in gestation, 0-6 months postnatal, and belly births. Props, modifications, and options are welcomed, as are feeding, changing, and attending to newborns. Suitable to all levels, and mindful of pronouns. This class is designed with a semi-static sequence, influenced by Sri Dharma Mittra and BKS Iyengar. We focus on holding asanas (postures) with integrity, with props, and introduce a variety of breathing (pranayama) techniques. Vinyasa means to place in a special way. Students are encouraged to use the breath as a guide for meditation in movement. This is a great place for yogis and beginners to play with a variety of balances, twists and inversions. Too much? Check our SLOW VINYASA class, a much gentler approach to the same principle. In 60 minutes, class moves through grounding breath awareness, to a series of heating asanas, time for exploration in new or challenging postures, a calming seated practice to draw awareness inward, and finishes with a well deserved rest. Yoga Nidra, also known as yogic sleep, is a state of consciousness between waking and sleeping. It is among the deepest possible states of relaxation while still maintaining full consciousness. 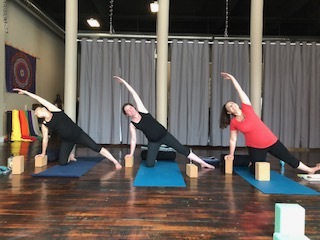 Yin yoga exercises tendons, ligaments, and fascia—the vital connective tissues not usually reached in traditional yoga classes.